SAN FRANCISCO, CA.- From February 6 through July 7, 2009, the San Francisco Museum of Modern Art (SFMOMA) features Patterns of Speculation: J. MAYER H., the first solo museum exhibition of work by the German architecture studio J. MAYER H.
Organized by the San Francisco Museum of Art (SFMOMA) and Henry Urbach, SFMOMA's Helen Hilton Raiser Curator of Architecture and Design, the exhibition is unorthodox in that it combines two approaches to showing architecture in a gallery: video documentation of the studio's built work and an environment, designed by J. MAYER H., that presents the architect's spatial language at full scale. Known for its commitment to a high level of formal and conceptual research, Berlin-based J. MAYER H. is one of the leading architectural studios in Europe, where more than 35 projects have been completed or are now under way. Central to the studio's experimental approach is a deep engagement with a ubiquitous yet often ignored image type: data protection patterns, such as those found lining bank envelopes and shipping labels. These patternstypically composed of numbers, letters, or logosserve to conceal other information, forming what Jürgen Mayer H., the principal of J. MAYER H., calls " information mist." Data protection patterns have become a fertile terrain for J. MAYER H. as the studio translates these patterns across media and scales to express its distinctive design language. For Patterns of Speculation, J. MAYER H. designed an installation environment that combines applied supergraphic elements and seating units that contain video monitors and projectors, immersing viewers in a matrix of enlarged three-dimensional data patterns. Within this environment, animated data patterns are shown on monitors, while images of the studio's built work are projected onto the gallery walls and ceiling. Finally, a sound environment has been developed by translating visual patterns into sonic ones, further surrounding the viewer with a thick cloud of "information mist." With its work on housing, universities, commercial, civic and office buildings, and large-scale urban projects, J. MAYER H. has been striving to develop a contemporary architectural language that addresses collective experience while avoiding historicism, generic minimalism, or digitally driven formalism. 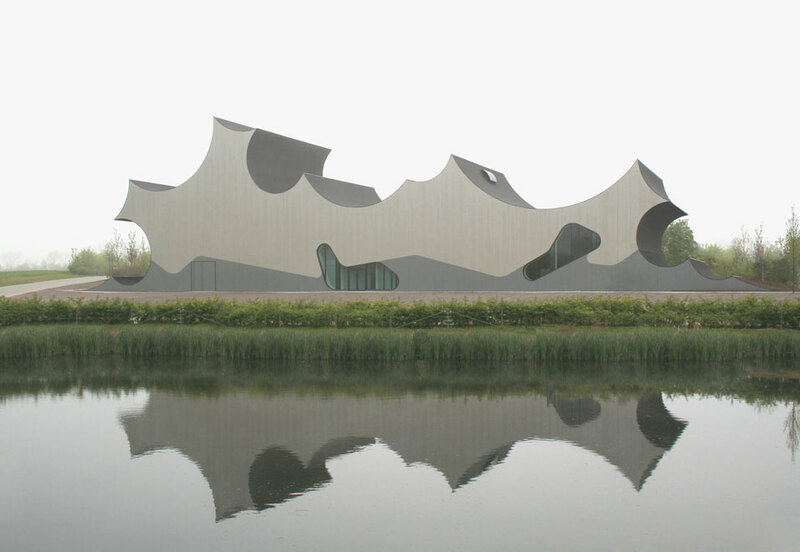 The firm has designed many acclaimed buildings, including the Stadt.haus for Ostfildern (2001), the Mensa Moltke dining hall for Karlsruhe University (2007), and Danfoss Universe Science Park (2007), in Denmark. The Metropol Parasol for Seville, Spaina transformation of the ancient Plaza de la Encarnaciónis expected to reach completion in 2010. In recent years, J. MAYER H. has received considerable international recognition, including a recent Der Spiegel feature and the April 2008 cover story in I.D. Magazine. The exhibition is accompanied by the newly released book, J. MAYER H., edited by Henry Urbach and Cristina Steingräber. This volume is the first to present the entire oeuvre of J. MAYER H. and to consider how the studio's research and built practice come together. A number of renowned authorssuch as Andres Lepik, John Paul Ricco, Ilka and Andreas Ruby, Felicity D. Scott, Henry Urbach, and Philip Ursprungtake a variety of approaches toward positioning the firm's work in contemporary discourse. Concurrently on view is Austere: Selections from the SFMOMA Collection. This exhibition brings together works from the photography and architecture and design collections that share a sense of reduced form and sober purpose. Thomas Ruff's interior photographs of Mies van der Rohe's Barcelona Pavilion and Bernd and Hilla Becher's photographs of water towers join two projects by Simon Ungers (one recently acquired for SFMOMA's collection) that propose an extraordinarily severe architectural language in finely rendered drawings and models made of rusted cold-rolled steel.